Wading through my files, I stumbled on a small series of letters written to and from the distinguished scholar Owen Lattimore in 1950-1951. I collected these letters from the special collections department at Johns Hopkins University several years ago, at a time when I was vacuuming up archival sources about Xinjiang’s history after 1949 from anywhere I could get them. The letters begin in April 1950, when Lattimore, then a professor at Johns Hopkins and consultant to the Department of State, received a note from three well-known Turkic leaders who had worked with the Guomindang in Xinjiang for several decades: Mehmet Emin Bugra, Isa Yusuf Alptekin, and Mesut Sabri. With the Nationalist Government’s capitulation in Xinjiang in September 1949, Bugra, Alptekin, and Sabri fled to Kashmir (temporarily) as exiled political refugees. In India, they tried to tell the world of Xinjiang’s plight under the repressive regime of the Soviet and Chinese communists. Later they brought this message to a new home base in Turkey. As they told Lattimore, the Turkic leaders were overjoyed that Dean Acheson had publicly shamed the Soviet Union for (allegedly) “detaching” Xinjiang from China during a Press Club address in January 1950. Although Acheson’s speech is remembered today for what he did not say about the U.S. defense perimeter in Asia—whether Korea was included—Xinjiang’s exile community probably didn’t notice. Acheson’s remarks about Soviet imperialism in China’s borderlands were good enough. Acheson’s sharp words signaled to Xinjiang’s exile community that the United States would support their plight. From Lattimore, Bugra, Alptekin, and Sabri wanted material and financial support. Addressing him as an “Adviser to the State Department,” they asked for “[help] from you or your friends,” noting that in the midst of the difficult journey to India, they and their followers lost all worldly possessions. If they were to survive in India, let alone agitate for Xinjiang’s independence, the three men needed help. Upon reading the letter, Lattimore did seek out money for Xinjiang, but not in the way Bugra, Alptekin, and Sabri hoped. Lattimore sought funding to recruit a language and area studies expert for Xinjiang (“such a man,” in Lattimore’s gendered language) for Johns Hopkins or another institution in the U.S. He sent off letters—which included a copy of the correspondence from the exiled trio—to the Foreign Service Institute, the American Council of Learned Societies (ACLS), and the University of Pennsylvania, all asking for funds or other support. Why did Lattimore want Xinjiang experts in Washington? Lattimore did not fully elaborate on why he thought this was a wise idea. He travelled extensively in Xinjiang with a team of researchers in the 1940s, the final product of which was a masterful text, Pivot of Asia: Sinkiang and the Inner Asian Frontiers of China. Lattimore and his colleagues reflected thoughtfully on Xinjiang’s economy, geography, environment, peoples, and international orientation. It was a timely and prescient text, one which still stands up today, in my view. At the time of Pivot’s publication and Lattimore’s fundraising campaign, the United States Consulate in Urumqi had closed, a CIA operative had been killed in an attempt to get out of Chinese Central Asia, and the People’s Republic of China and the Soviet Union had inked a series of agreements to jointly develop Xinjiang. Denied access to the region, perhaps Lattimore feared that a knowledge gap would develop among Americans, preventing them from understanding this “pivotal” region in Central Asian and Sino-Soviet affairs. He wanted someone deeply familiar with the region to train students in order for the United States to be prepared for Xinjiang after the revolution. The Administrative Secretary of ACLS, Mortimer Graves, concurred with Lattimore that “an expansion westward from your Mongol work is certainly in order, and the Turkish of Sinkiang [Xinjiang] would seem to be a next normal step.” Though Graves was not in a position to shell out the cash, he did volunteer to approach several other philanthropic organizations on Lattimore’s behalf. “I shall not be satisfied until we have an active American development in study of the Central Asiatic Turks,” Graves finished his letter. In the end, the most Lattimore could do was send his Xinjiang contacts in exile two copies of Pivot of Asia—although it seems the books may never have arrived. The information and photos above can be found in: Johns Hopkins University, Sheridan Libraries, Special Collections, Record Group 08.010, Records of Walter Hines Page School of International Relations 1923/1955, Subgroup 2 (Administrative Records, 1924-1955), Series 4 (Owen Lattimore), Subseries 3 (Correspondence), Box 5, Folder 14 Sinkiang Refugees 1950-1951. I thank the staff of the JHU Special Collections department for helping me to retrieve these files in April 2013. Hi, This is very important information about Oven Lattimore’s personal relations with Uyghur nationalists during the 1950 in India. 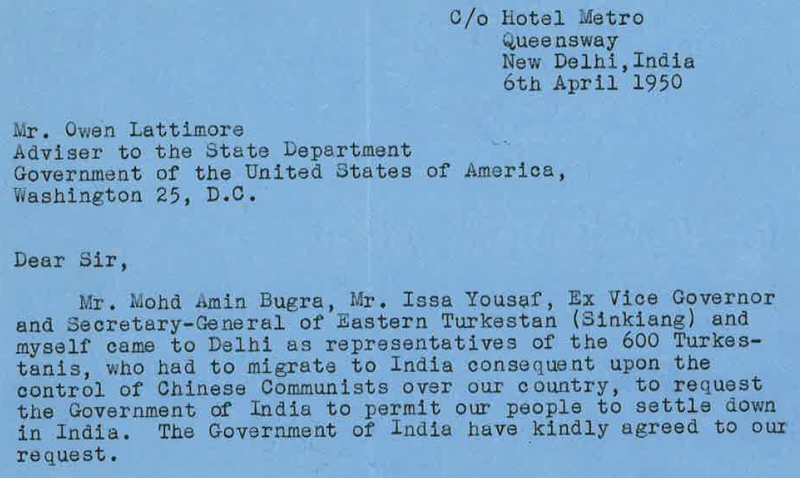 One thing, I would like to mention that Muhammad Amin Bugra and Isa Yusuf Alptekin fleeing to India from Urumchi at that time, but the former Chairman of Xinjiang Provincial Government, Mas’ud Sabri did not went to India. He was left in Urumchi and willing ti die on his mother land. He was house arrested at the beginning of 1950 at his house in Nurbagh in Urumchi and died mysteriously in 1951. His fellow friends Bugra and Alptekin live in exile since Communist troops take over Uyghur land. Wonderful information and an important correction. Something I should have remembered from my research on the 1949-1950 transition that I did several years ago. The third signatory is written as “Colonel Adam Sabri.” I hastily assumed this was a misspelling for Masud. Is this a name you’re familiar with?